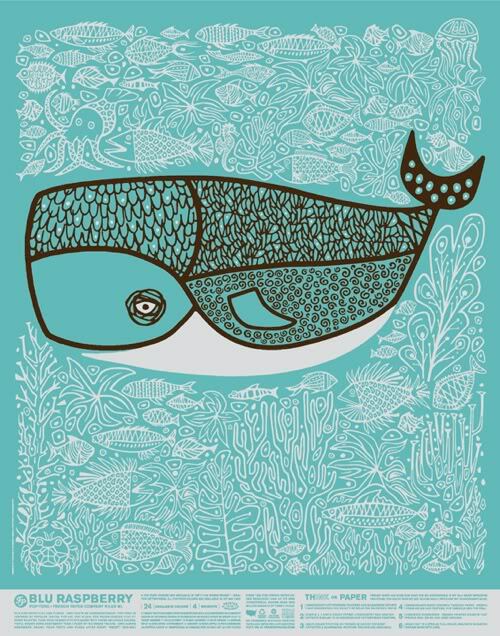 shine brite zamorano: a whale's tale. A series of links from one art blog to another led me to the image by CSA Design that you see below. My first reaction (to self)- love this! second reaction (to self)- 2nd grade line project! It is such a great image. Cheerful and innocent. Rich with line and shape teaching points for my students. Many of the images that the CSA Design firm has created (and they have made many, many of them) since 1989 have similar characteristics. Not necessarily cheerful and innocent, but rich in teaching possibilities and just very well put together. Very smart sense of composition and design. The students and I checked out a number of images from the company website and talked about the use of contour lines to create a variety of natural shapes. We touched upon the balance between positive and negative shapes (character and background). 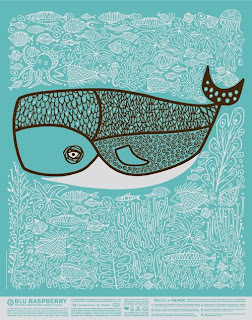 We also spent a few minutes talking about why the whale stood out from the background. A triple answer the class soon found out- due to its size contrast, its color contrast, and that it's right in the middle of the paper! When we got to the hands on part of the lesson, the construction of the whale was done through direct instruction, but the whale patterning and background underwater elements were up to the students. The kids really enjoyed creating their own whale designs. They had a chance to incorporate a wide variety of underwater elements. The smart design of the original image really provided a great template for students to visually succeed with. The front and back inside pages of I'm the Biggest thing in the Ocean look just like the background to that print as well. One of my favorite things about the book. Another totally creative idea you've shared! I had to laugh about the silver Sharpie comment....I too hoard those like crazy so they won't dry out!